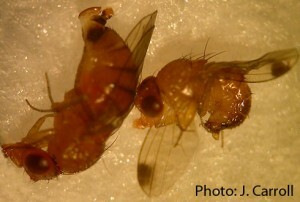 Spotted Wing Drosophila Latest information from the NYS IPM Program. As expected this late into the summer season, SWD was caught a second week in a row at a blueberry farm in Herkimer County. 7 males were caught in the traps set in and around the blueberry field, during the week ending August 9, 2018. These traps are being monitored by Bernie Armata, Herkimer County Cornell Cooperative Extension. 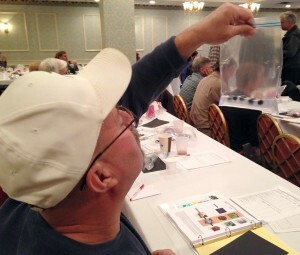 Checking fruit for larva with salt flotation at a workshop on SWD sponsored by the NYS Berry Growers Association. The grower has continued monitoring for fruit infestation using salt flotation. Harvest is winding down and the farm will be closing in a few days. SWD monitoring, fruit.cornell.edu/spottedwing/monitoring/ – describes what you can do. SWD management, fruit.cornell.edu/spottedwing/management/ – describes what you should do. SWD distribution, fruit.cornell.edu/spottedwing/distribution/ – describes where the CCE network is finding it. Ticks don’t really care where you are farming so we are hoping to keep all our growers safe from tick borne diseases. The Community IPM Program (part of NYSIPM) was funded by the NY State Senate Task Force on Lyme and Tick Borne Disease to create an educational campaign about the risks of tick exposure and tick awareness for New York. Community IPM addresses non-agricultural pest issues for every New York resident, including farmers. 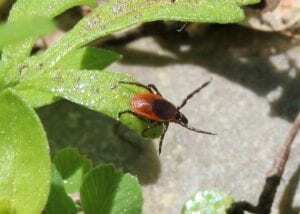 This survey is a research project to help us understand what tick issues and concerns NY farmers are facing on their farms and home properties. By completing this survey you are agreeing to participate in this research. Your answers are completely anonymous and will help us understand how serious the issue is and how to raise awareness with the farming community. For more information about this survey or about ticks and tick prevention or control, please contact Jody Gangloff-Kaufmann at jlg23@cornell.edu. Both sites in Chemung County are now at sustained catch. During the week ending July 27, 2018, 4 males were caught at one site with a raspberry and a blueberry planting, and 6 males and 2 females were caught at the other site in a blueberry planting. These sites are being monitored by Shona Ort, Chemung County Cornell Cooperative Extension. Why does the SWD population explode? You can do the math. Let’s think optimum conditions for SWD development. A single female can lay around 350 eggs during her lifetime, about 15 per day. The egg to adult phase of the life cycle takes as little as 6 days. So, one female in one day can result in 15 more adults 6 days later, and, during those 6 days, she will have laid another 90 eggs. 6 days after that, those 90 eggs will all be adults. Half of the 105 adults will be females, capable of laying ~350 eggs during their lifetimes…that’s 18,375 eggs or 9,187 females in about two weeks. Meet and greet – male (right) and female (left) SWD – on a raspberry fruit. A typical life span for SWD is 3 to 9 weeks and there are estimated to be about 10 generations per year in the US, depending on climate. Back to the one female. Let’s say that she lays 70 eggs per week and, when she dies in 5 weeks she’s laid 350 eggs and, by then, about 280 of those are adults. Half of those adults, 140, are females and, by then, have laid 49,000 eggs, 29,400 of which will, by then, be adults. Half of those adults, 14,700 are females and, by then, have laid 3,087,000 eggs …I’m lost and I probably made a mistake…but you get the idea – over 3 MILLION in five weeks from ONE (really from two, because you need a male and a female). After a very early first catch in late May, SWD has again been caught in Erie County. Re-catch occurred the week ending July 12, 2018, when two female SWD were caught, one each in traps on the edge of and within the blueberry planting. Seven SWD were caught the subsequent week, ending July 18, three females in the edge and three females and one male within the planting. Traps at this location are being monitored by Sharon Bachman, Erie County Cornell Cooperative Extension. Blueberries are ripe across the region and harvests are underway. Once again, it’s time to pay attention to SWD and protect ripe and ripening fruit crops from infestation. 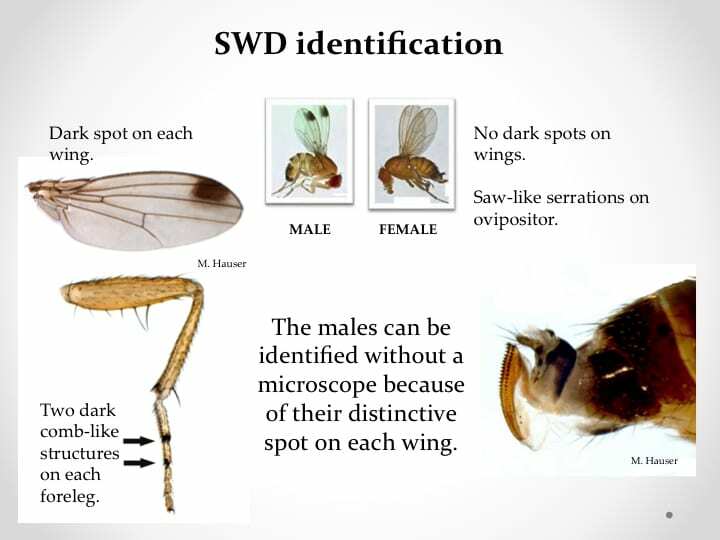 Key characteristics used to identify SWD. SWD found in Dutchess County, as of the week ending on July 10, 2018, and sustained catch during the week ending July 17. On July 10, four females and one male were found in the raspberry crop, and three females and two males were caught in the nearby hedgerow. On July 17, only 1 female was found in the traps set in the crop and one female in the hedgerow. Female SWD, on left, has large ovipositor. Male SWD, on right, has a spot on each wing. Interestingly, the number of SWD caught decreased significantly from the first week to the second week possibly indicating that effective management tactics were put into place at this location. SWD needs to be managed in susceptible fruit — know if it’s on your farm and know how to fight it! The traps in Dutchess County are being monitored by Zayd Normand, summer intern, working with Peter Jentsch, Hudson Valley Research Laboratory. A blueberry grower in Tioga County monitoring traps daily for male SWD in their planting caught 6 males in one day, July 21, 2018. No SWD were found in traps up to and including Friday, July 20th. Homemade SWD trap. 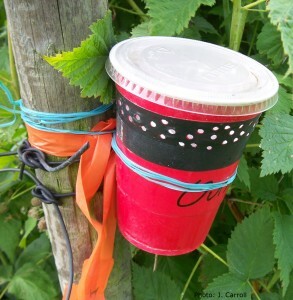 The red cup contains an apple cider vinegar drowning liquid and a specimen cup with a wheat dough bait. Traps are checked daily for males. The blueberry grower is making their own traps, using whole wheat dough as the bait and apple cider vinegar as the drowning liquid. Instructions for these whole wheat dough traps are on the SWD Monitoring page. Only two Counties reporting zero SWD trap catch (gray) – Herkimer and Orange – as of July 23, 2018. Elsewhere, across the CCE SWD monitoring network, all locations have reported in. Only the sites in Orange County and in Herkimer County have yet to catch SWD. Dutchess and Erie Counties are now at sustained catch. Details of these findings will be reported in a separate blog. Three SWD were caught in two traps set in and on the edge of a blueberry planting in Chemung County; 2 males and 1 female. These traps are being monitored by Shona Ort, Chemung County Cornell Cooperative Extension. Blueberries are ripe at this location and an insecticide program will be put into place this week. Two male SWD on a blueberry, in early September 2013. SWD populations typically build to very high levels in late summer. Although the hot and dry weather has compressed fruit maturity such that early-, mid-, and late-season blueberries are ripening almost simultaneously, this weather will also keep SWD population growth somewhat suppressed. …but don’t count on the weather to protect your fruit. SWD populations will continue to build through early fall until reproductive diapause sets in around October. 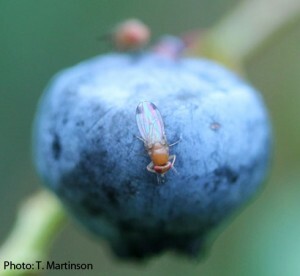 Detailed information on spotted wing drosophila is on the Cornell Fruit Resources website at http://fruit.cornell.edu/spottedwing/. 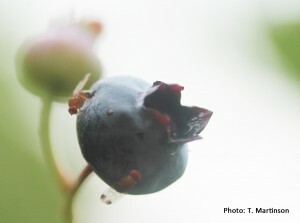 A male spotted wing drosophila (SWD) on blueberry; another likely SWD is in the background. SWD has now been caught two weeks in a row in Columbia, Livingston, Onondaga, Orleans, Saratoga, Washington, Wayne, and Wyoming Counties. It’s time to pay attention to SWD and protect ripe and ripening fruit crops from infestation. Thank you for monitoring SWD in these Counties! We have caught SWD at all but one of the seven tart cherry sites we are monitoring in Western NY, Wayne and Ontario Counties. Counts are still low and it is likely that the hot and dry weather, as well as insecticide protection, has held things in check. Weather has turned cooler and rains have brought needed water to crops – SWD will like this, too. Our low numbers are in stark contrast to the high numbers of SWD being reported this week by Nikki Rothwell, Michigan State University, in traps set in Michigan tart cherry orchards. NOTE: First trap catch of SWD signals it’s time for insecticide protection in tart cherries. 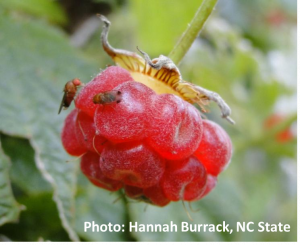 And… most berry sites in the statewide SWD monitoring network are now at sustained catch! Two are at continuous catch – third week in a row. One has had discontinuous catch – SWD caught three times, but with intervening weeks with zero catch. One is at sustained catch. Two are at first catch. One has had zero SWD catch to date. Cherries are ripe and soft and harvests are getting underway. Orchards in Western NY that have been harvested or will be harvested soon should escape SWD infestation without significant insecticide expense. If harvest won’t occur for another week or more, insecticide protection on the crop needs to be maintained at 7-day intervals; immediately reapplying after rain wash off. A 50-fruit sample was collected this week from all the orchard blocks in which we have traps and checked via salt flotation. One of the samples had evidence of SWD eggs, no larvae. All other samples had no SWD in them. If, after harvest, there is remnant fruit on the ground that might put nearby cherry orchards or berry plantings at risk, consider a single application of Asana XL (2ee) on the fruit remaining on the ground (see quick guide to insecticides for treating dropped fruit). Keep in mind that the dropped fruit would have insecticide residue on it, so any application to dropped fruit should be delayed to take advantage of that residual insecticide coverage.